The Race Between Religion and Spirit. Ah yes, running in slow motion. We’ve all done it. To Vangelis’s music from CHARIOTS OF FIRE. British film, written by Colin Welland, directed by Hugh Hudson, nominated for 7 Academy Awards, winning 4 (including Best Picture). 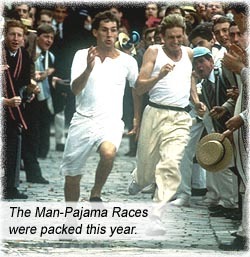 CHARIOTS OF FIRE is based loosely on two real life British runners in the 1924 Paris Olympics, who run for very different reasons – Harold Abrahams (Ben Cross) runs to prove himself above the anti-semitism he’s experienced all his life, while Eric Liddell (Ian Charleson) runs to glorify his christian god: “To win is to honor Him” (which should make anyone trip over from laughing so hard. Even in slow motion). Movie opens at Caius College Cambridge in 1919, when fervor for The Great War (though what made it “great” is beyond my ken) is still high in everyone’s nostrils, and British supremacy was tangible in the world. The British runners all meet here as students. Different people would perceive different parts of this movie as inspirational. For an athlete, the running in slow motion, the sacrifices and the winning – both Liddell and Abrahams would go on to win their respective races and bring glory to Britain; for a religious fanatic, the nutty equating of Christ with racing – Liddell gives a speech loaded with metaphor, “committing yourself to the love of Christ – that is how you run a straight race” – demonstrably ridiculous, because Jewish Abrahams ran “straight races” as well, metaphorically as well as literally – by committing to the love of Allah. And there are so much of Liddell’s ravings and rantings and refusing to run on Sunday at the Olympics, that it turned me off the film. This real life athlete ruined a film honoring him because his character (Charleson) had to portray him as the lunatic he was. Liddell’s life plan is to visit China as a missionary, but he puts those plans on hold to attend the Olympics, because, “I believe that God made me for a purpose, but he also made me fast, and when I run, I feel His pleasure.” Suuure you do. Anything as an excuse to rationalize fun. After the Games, he does actually give up running to spread the disease of christianity in China. Liddell meets with Olympic and state officials who urge him to compete in his Sunday race, “In my day, it was king first, God after.” Liddell replies, “God made countries, God makes kings, and the rules by which they govern.” God also makes wars. Reconcile that with your missionary work, Running Boy – oh, I forgot, missionary work IS insidious war, after all, on Other People’s beliefs. This is one of those films where it is pointless speaking of the performances, which are so natural and top notch, it is no wonder CHARIOTS received so many awards: Ian Holm is Abrahams’ trainer; Sir John Gielgud once again defines Spectacularly Imperious by appearing in the dictionary right next to the word, and here as a College Master. Sadly, two young American actors who were stars in their own right appear here in their last major feature film before virtually disappearing from cinema, Dennis Christopher (who made his mark as the determined young bicyclist in BREAKING AWAY, 1979) and Brad Davis (who shook our foundations in the disturbing MIDNIGHT EXPRESS, 1978). Watching both Abrahams and Liddell cheer each other on during their respective races for Britain – though both were mortal running enemies – was a joy that no religion could sully; the physicality of driving human bodies to such extremes of performance; the intricacy of cardiovascular function that fuels the human animal; the tendons, joints, muscles, bones impacting the Earth, surging forward in opposition to gravity; the wonder of the raging human adrenalin machine stretched past breaking point… If only Eric Liddell could have understood there is a much more wondrous power than his mythical Christ – humanity. Run from the truth, Eric! Run in slow motion! Starring: Ben Cross, Ian Charleson, Iam Holm, Nicholas Farrell, Nigel Havers, Daniel Gerroll, John Gielgud, Lindsay Anderson, Nigel Davenport, Cheryl Campbell, Alice Krige, Dennis Christopher, Brad Davis.